Offering you a complete choice of products depending on viewer machine speed requirement (bottles/min). Automatic smooth high speed synchronisation of labelling operation by Machine Conveyor. 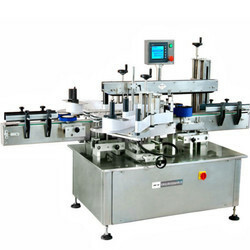 Vertical & Horizontal adjustment of Label dispenser by wheel control. Minimum load at the Infeed. No Roll – No Label.